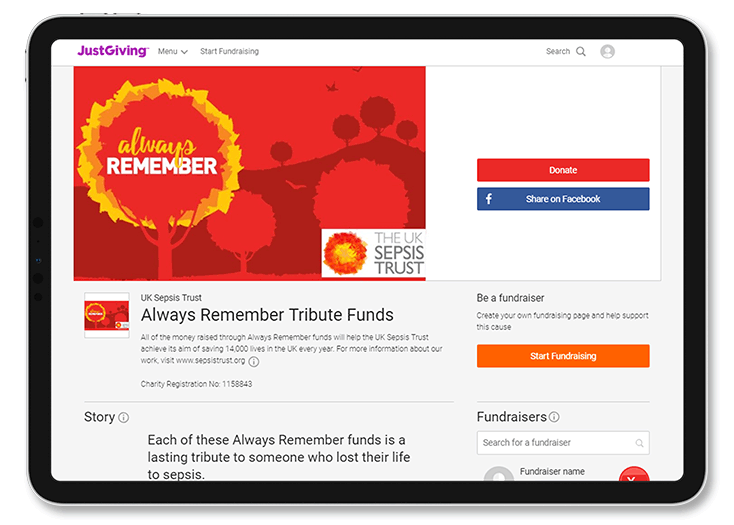 Setting up an Always Remember Fund is a powerful way to keep your loved one’s memory alive – and raise funds to ensure that more people survive sepsis in future. It’s an easy process to set up your Fund, and once it’s running, it provides a straightforward way for friends and family to pay tribute. You can add to your Fund whenever you like and keep it for as long as you want. It takes just minutes to set up your Fund – start here. You’ll be taken to JustGiving, where you can create your personalised page. It takes two steps if you already have a JustGiving account, and three if you don’t. You can then personalise your page, for example with photos, a campaign name, a short introduction to your Fund or a fundraising target. What is an always remember fund?